For people who want to land a better job position or a particular organization, submitting it writing a cover letter is a must. This kind of personal business letter is very important as you get to introduce yourself and to show to the people reading your resume that you are fit for that particular position. In any job application, you often find a lot of employers asking for a cover letter. Unfortunately, there are so many applicants who make that mistake of writing a generic cover letter not considering the fact that it can negatively affect their application. Before you start writing a cover letter is very important that you know the purpose of having one. Your cover letter enables you to introduce yourself, and writing a good cover letter can take some time. It is also where you mention the specific job you are applying for along with the skills, knowledge, and work experiences that match the job requirements. With the content of your cover letter, you actually encourage the hiring manager or your future employer to read your resume and lastly at the end part of your letter you end it with a call to action in order to have an interview. A cover letter is not too different from other application letters. It is just different in a way that you need to focus on your professional capabilities, work experiences, and a set of skills that will match the requirements of the job that you are applying for. In a personal cover letter, make sure that you include a salutation. There is a variety of salutations you can choose from. Check our “salutations” page to learn more about them. It will depend on how much information you have about the recipient when writing a good cover letter. If you know the name of the hiring manager, your salutation should include his name. Make sure to address the manager formally using his proper title (Mr. Ms. Miss, Dr.). If you do not know the name of the hiring manager, consider addressing your personal cover letter to the like “Dear Hiring Manager”. As a last resort, address the letter “To whom it may concern” though it is not recommended at all. The first paragraph in your personal cover letter is where you will mention the job or course for which you are applying for, how you found out about the job or the course. Poor cover letter and personal letter. As much as we despise them, they are a chance to make a case, cover everything we can’t express in our resumes – which is a lot – and come across as real people to the recruitment panel or hiring managers. Don’t throw a cover letter together in the hope that nobody will actually read it. To take advantage of its full potential, take advantage of these steps our professional writers have to give to you about writing personal cover letter. Put yourself in the position of the hiring manager. When writing a cover letter in their perspective, you know what information and details they are looking for. Be straight to the point. Highlight your strengths and capabilities. Your cover letter should be able to show that you are the person who can add value to the organization and is perfectly fit for the job. Do not write just generic content. Do you have previous cover letters? Most people tend to just submit their old cover letter thinking that it is just the same. Keep in mind that every job has different requirements. So, you have to customize a cover letter that fits the job position you are actually applying for. Do not be too confident when writing a good cover letter. Be humble and be sincere. Having troubles making your personal cover letter? We are here to offer you our professional writing and editing services. By availing our services, you are guaranteed to have a customized cover letter. The opening statement of your personal letter determines whether the person reading is keen on hiring you. First impressions still matter when writing cover letters. If you are able to create a striking statement from the very beginning, you capture the interest of the person reading your application. Then, you can just focus on providing specific information and details about you that will help the hiring manager or employer to see that you are the person fit for the job. When writing a cover letter, always start with a formal and nice greeting. Next is you state your purpose. What position you are applying for? When giving these details, it helps that you show your interest not just in the position as well as in the organization. It does not hurt to actually flatter your future employer. From there, you can transition into marketing yourself as a potential candidate who can actually give value to the organization. 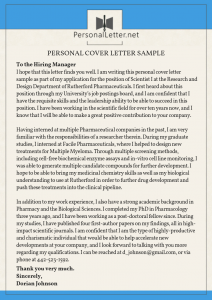 The way how you start your cover letter can significantly impact your application. Make sure that you’re writing a good cover letter that will encourage the reader to go through your cover letter and application. Do you need professional help with writing a cover letter? We are glad to provide you with writing and editing services that guarantee you only superior content for your cover letter. Why am I a qualified candidate for this position? What work experience do I have that fits the job or course requirements? Why do I want to work or study in this college specifically? The final paragraph in your cover letter writing should wrap up and discuss how you will proceed with the application. When writing cover letters end the letter with a respectable closing statement. You can also get our writers creating a personal business letter for you. Your cover letter should include all of the essential details and information about your professional career and work experience. Just put yourself into the shoe of the hiring manager or your future employer. When there are so many applicants who are vying for a particular position and they only need to choose one, how will they be able to sort out applications? To get that dream job, you really have to make an effort to submit not just a well-written letter, but you should also be able to show that you possess the knowledge, skills, and the passion that the company is looking for. Unfortunately, the reality is that a lot of professionals in as much as they want to make time for their personal cover letters, they just can’t do it with their busy schedules. The good thing is that we are here to offer you our excellent editing and writing cover letters services. You never have to worry about the quality of your personal cover letter writing as we are here to help you all throughout the process. We offer a wide range of services tailored to fit the individual needs of our clients, we know what writing a good cover letter takes. If you need help with the template and the structuring of your personal cover letter, we can also do that for you. For most of our clients who need Superior content, we have a team of experienced and talented writers who know exactly what to write in your personal cover letter. In cases where the client needs we have editors as well as proofreaders who will always be there to ensure that the content is free from any kind of error. Our clients both previous and even returning clients would vouch for the quality of services that we are able to provide with writing cover letters and more. By availing our services, you are guaranteed to have only the best and most reliable editing and cover letter writing services at an affordable rate. Don’t hesitate and order an astonishing personal cover letter from our expert team!